Lou lives in a small town in the South, where all the colorful characters are always in each other’s business. My favorite! Also, Lou has a mystery on her hands: When she learns that her family will have to sell their home, she is determined to find a treasure that was supposedly stolen and hidden on their land by one of her ancestors. But it seems like someone else in town may be after it too! Lou and her friends are in a race against their competitor and against the clock as they frantically try to piece together the history of Lou’s family to figure out where the treasure might be stashed. So you can see why I enjoyed this book so much! Kooky characters in a small town? Check. Mystery with a lot at stake and yet not a lot of danger? Check and check. Another great thing about this book is that it tackles not just the history of slavery in the South, but also the issue of present-day racism. 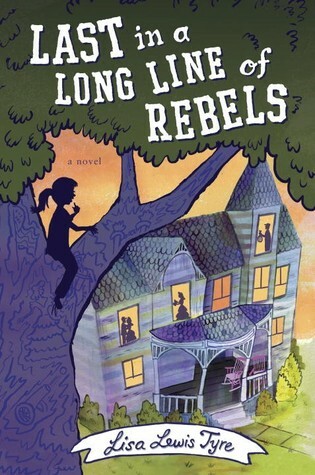 So even though the overall tone of the book is not too serious, there are definitely some important questions that Lou struggles with as she tries to understand how her ancestors could support slavery in the past and how her neighbors can be prejudiced today. I recommend this book for fans of Three Times Lucky, Book Scavenger, Absolutely Truly, and Moon Over Manifest. If you’ve read Last in a Long Line of Rebels already, leave a comment with your thoughts. Or tell everyone what kind of books you just can’t resist. Karen forgot to mention she is also drawn to stories that take place over the summer — which includes Last in a Long Line of Rebels!